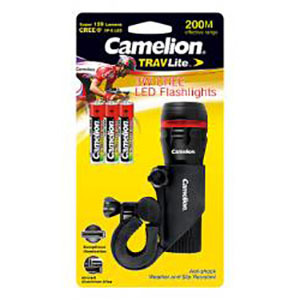 The Camelion TRAVLite Bike Light - Flashlight provides exceptional brightness with a CREE XR-E LED for extreme performance. Additionally, you're getting 3 lighting modes including a strobe & red emergency alarm ring feature with up to 650 feet effective visibility range. This bike light has an adjustable focus beam and if you remove it from your bike for use as a flashlight, a convenient wrist strap. Constructed with touch aircraft aluminum alloy, weather and slip resistant with an easy to install rubberized grip on your handlebar.